There’s a word that describes a Latin American culture of subsistence and small-crop farming: campesino. It literally means, “without land,” and it refers to the neediest communities, the people most on the margins. 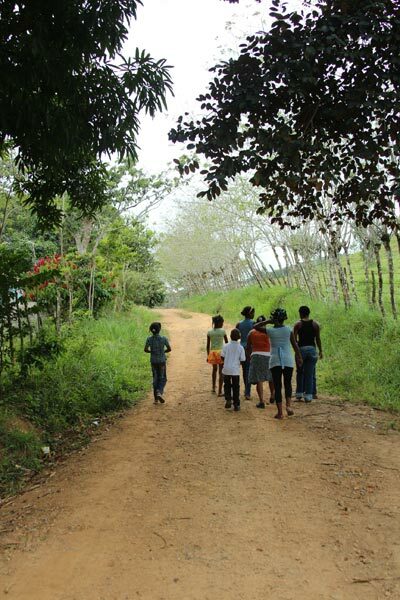 On Thursday we traveled deep into campesino territory, to a small village called Las Guyamas. The terrain reminded me of El Salvador: lush green hills grazed to the edge of erosion, bantam chickens strutting and scratching beneath banana trees, houses with tin roofs and slabwood walls standing forlorn in dirt yards worn shiny by bare feet. Literally the end of the road. It’s easy to consider a community like Las Guyamas as a forgotten place. 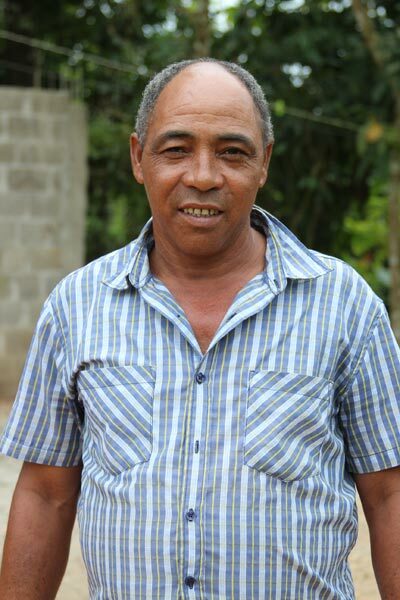 A community left out of not just the global economy, but largely out of the Dominican economy as well. These are people with few options, and little, if any health care. As we ascended toward the church where we would hold our screening clinic, we stopped at the houses along the way to spread the news that a team of doctors and nurses were here to provide medical care. Freed of set-up duty, Tom and I shouldered our cameras and walked back downhill, hoping for shots of the people walking to the clinic. Near the community’s single water pump we met Martin, a man who shook our hands with gusto and answered my questions with a smiling generosity. Ellen, the Peace Corps volunteer who has helped with translating duties during our clinics, had said that she knew most of the families along this road, as she’s been working for the past year to bring an uncontaminated water supply to the village. So it’s possible that her presence helped pave the way for our easy interactions with Martin. But I’d found a similar openness in most of the campesino villages I’ve visited in my trips to Latin America. Back at the church, we were swarmed within 15 minutes of opening the doors. As this was our second clinic, we had a better sense of our roles. I was again to help with teeth-varnishing duty, telling the kids what to expect and translating for their parents as needed. In starting this blog, I promised myself that I would resist any easy platitudes about the simple way of life deep in the hills of the Dominican Republic. 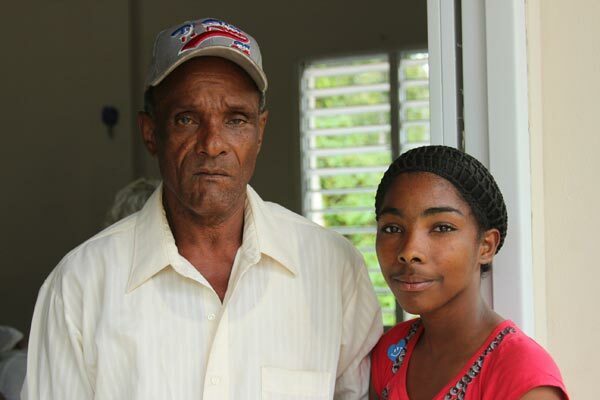 There are many problems in Las Guyamas, and lack of health care is just one of those problems. Rita told me that mothers worry about snakes strangling their young children, and so cut cardboard to cover the holes in their wooden walls. When many kids opened their mouths for the fluoride varnish, I could easily count multiple cavities in their mouths, the gray and black spots visible from five feet away. Martin, the man who toured Tom and me us around the village when we first arrived, fell out of a mango tree two weeks ago and broke his wrist. He showed up at the clinic wearing a poultice, a scrap of fabric covering some leaves. “I didn’t ever think that I’d have to use the word ‘poultice,’ in my practice,” Justin said. After listening to me repeat my spiel about the fluoride varnish multiple times, a vivacious local mother, Ana Maria, took on the responsibility for telling the mothers that their children shouldn’t brush their teeth or eat anything hard for two hours after receiving the treatment. Rita asked me to take a photo of Ana Maria’s son, who is being sponsored by a family in the Upper Valley, an exchange that Rita developed. 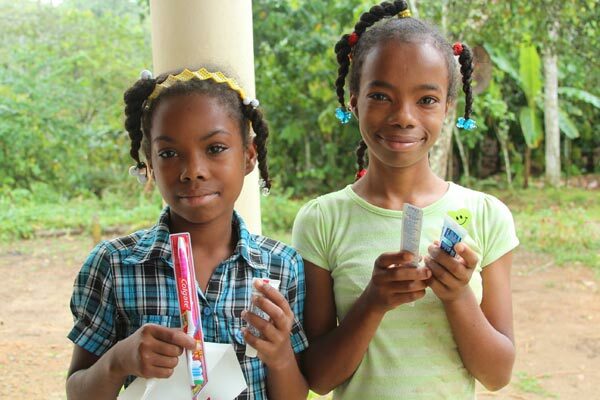 Six families receive $300 of support annually from the sponsors, with the money being used to buy clothing, pay school fees, and buy food staples. Rita also asked me to take the photo of another teenager, a girl named Claribel, to send to her sponsor in the Upper Valley. Claribel hopes to become an engineer. About an hour after I took the photo of Claribel and her father, the girl asked me to deliver a handwritten note to her sponsor. It was neatly written, with multicolored decorations in the margins. Curious if I knew her sponsor, I scanned the first paragraph. As I hinted before, campesino territory is not new to me. I worked in a refugee camp for Nicaraguans during the Contra war in the mid-’80s. Slept in dirt-floor houses for a week in interior El Salvador shortly after *their* war ended, hearing stories of atrocities I’d rather forget. Helped a family pick coffee in rural Mexico, and ate with them in their house made of debarked tree trunks sunk into the mud. Wattle walls and a thatched roof and several scrawny dogs edging for scraps beneath the machete-hewn table. I’ve seen rural Latin America, I had told myself going into this trip. I wouldn’t be the one to suffer culture shock, to be blown away by the scope of the need we would see. But when I read the first line of Claribel’s letter, my emotions threatened to overwhelm me. Taking a quick break from varnishing and translating duty, I pretended to change the battery in my camera, then walked around in the mist outside, trying to stop my tears. The purity of Claribel’s hope and her love in that sentence hit me like the glow emanating from Indiana Jones’s ark, like what some would describe as God, or others would call the strength of the human spirit. I only made it through the first two sentences, but I must describe that piece of paper as something holy. And so I will put aside my adult agnosticism long enough to consider again that Jesus spent most of his time on earth with the poorest of the poor, and that perhaps these people, these campesinos, *are* Jesus at times, are the incarnation of the best of what humanity has to offer. I returned to work, wiping my eyes. Soon, Ana Maria took me by the hand, forcing me to eat lunch, despite my protestations that the line of kids trailed out the door. Eat, she told me. Then, sterner, more motherly: Eat. No knock against what our host, Chi-Chi, has prepared for us, but this lunch was hands-down the best thing I’ve eaten since we’ve arrived in-country, including our expensive dinner by the sea in Boca Chica. And much, much more satisfying. As Ellen said later, nothing would have prevented the community’s women from feeding us this day. People of Las Guyamas walking to the clinic. Our clinicians were hitting on all cylinders now, explaining diabetes testing kits, reviewing X-rays, diagnosing hypertension. Raeann and Kathy performed more than 40 fluoride varnishes, and gave away almost all of the large bag of toothbrushes we brought. After we saw the last of the patients, the women of Las Guyamas gathered us in a circle to thank us, to make speeches, to sing and recite poems and tell us we *must* visit them the next time we are in Cotui, all of us. The members of our group, though tired, shone as if from reflected light. And after a bumpy ride out of the mountains, we gathered at our home base to process what we’d witnessed. We talked about how great it felt to have the community appreciate the little we were able to do. We didn’t feel worthy of being sung to, of having speeches given in our honor. But they were so appreciative that we paid attention to them on this day. We talked about the heavyset woman – obviously one of the leaders of the local women’s group – who recited a poem and laughed and sang, showing her mouth missing many teeth, and Justin observed that while she may have the worst teeth in the world, she has the best smile. He noted that this woman would need to hide herself in our culture, would be embarrassed by her appearance, but here, she’s an inspiration. Rita said she loves how unencumbered the people in the villages are. That they always find a way to rise above, and make the best out of what they have. Kathy said that she was even a bit envious of their joy, at how natural it was for them to get up and sing. Tom told about standing on the road with his tripod as a trio of teenaged girls walked by, singing like angels. We all agreed about how much we have to gain from observing what these communities have to offer, and I understood that this sort of experience was exactly why I wanted to come on a trip like this. But, for a moment, can we take a break from thinking about ourselves, we Norteamericanos who always need to have the best of everything, from gourmet coffee picked by subsistence farmers in interior Mexico, to laptops made by desperately unhappy workers in Chinese factories, to clothes made by teenagers in Sri Lanka, or Bangladesh, or El Salvador? In exchange for learning from the generosity of these people who are defined by what they *do not* have – these campesinos – can we agree that their kids won’t get sick and die of preventable diseases, that they will have clean water, that they can build their houses of cinder blocks instead of scrap wood or even mud, that their children can go to school and learn more than their parents but still keep this crucial spirit, this amazing resilient humanity, intact? Rita is working at this, as is Ellen, the Peace Corps volunteer. The rest of us contributed half a day to that effort. And we wished that we could have done more. Thanks so much for your comment. It was terrific to meet and work with Ellen. We were all very impressed with her! I assume by your note that she is still in the D.R.? She was clearly in her element, and the people she related with clearly held her in high esteem. Ryan…you are an inspiration! Mucho gracious. Wow – amazing post, Ryan – I love reading these. I envy you and can’t wait to hear more stories when you come back! Carry on with posting….